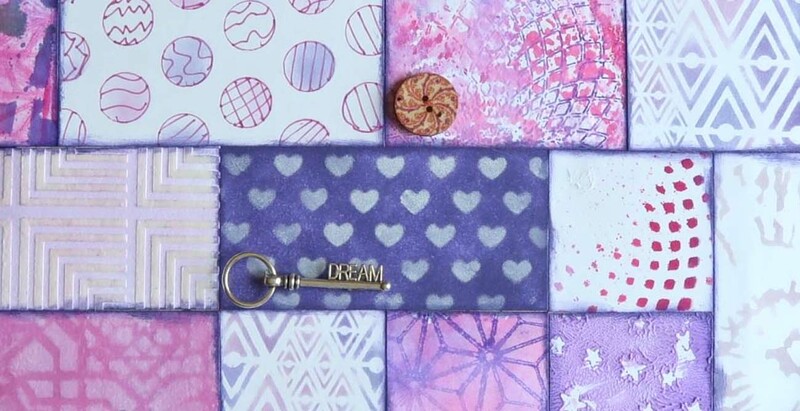 Celebrate National Scrapbook Day with this Stunning Layout! Happy National Scrapbook Day! I love scrapbooking because it gives you a chance to capture memories with those you love. Another feature is you get to collage together beautiful images and colors to encapsulate those memories. In today’s project, I choose lime and purple as the perfect color combination for a young at heart! This layout is filled with interesting floral details combining some of my favorite ink products in a vibrant color combination. Enjoy! Stencil a circle background onto smooth white cardstock using texture paste. Leave the paste to dry. 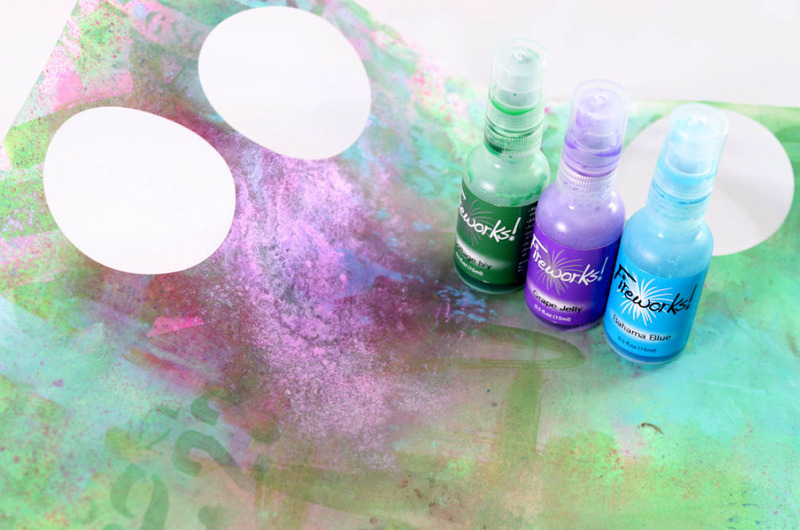 Create color by misting the texture with Fireworks sprays and leave to dry. On the second sheet of white cardstock create a background using Radiant Neon in Electric Green and Delicata in Emerald Green. Use the direct to paper technique to add the color. You can also add color with inkers for even more intensity. Once the background is dry. 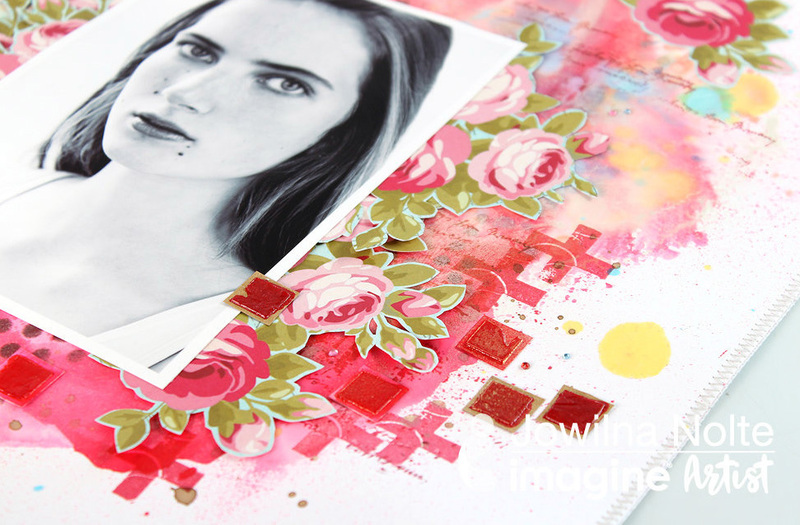 Use Delicata ink and stencil a pattern onto the background in selected areas. Punch 2½” circles from your background as well as some 1” circles. Mist the background with the same colors of Fireworks that you used on the background. Spray in selected areas to create a beautiful shimmer. Assemble the punched out circles, a photo matted on a black background, and cut out flowers from the patterned paper on the background to create your layout. Add a title like “drive” and additional embellishments like the stars and hearts to finish off the layout. Add additional Walnut Ink splats as well as colors ink splats using the Fireworks sprays. 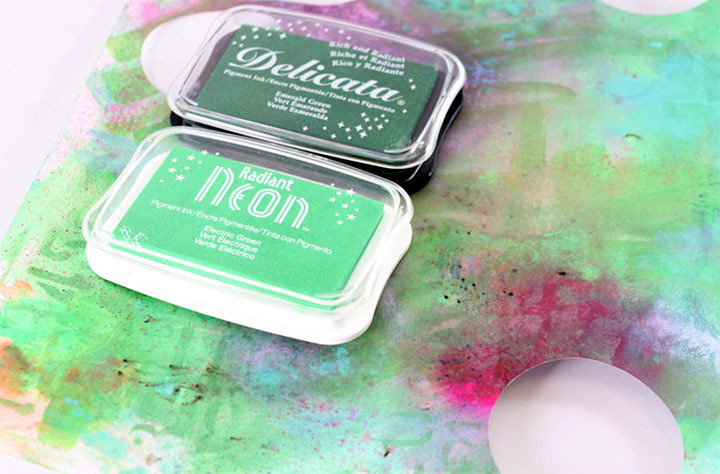 Add a small amount of Creative Shimmer onto your Craft Mat. Add a few drops of dye inkers to the medium. I added 2 colors of red. 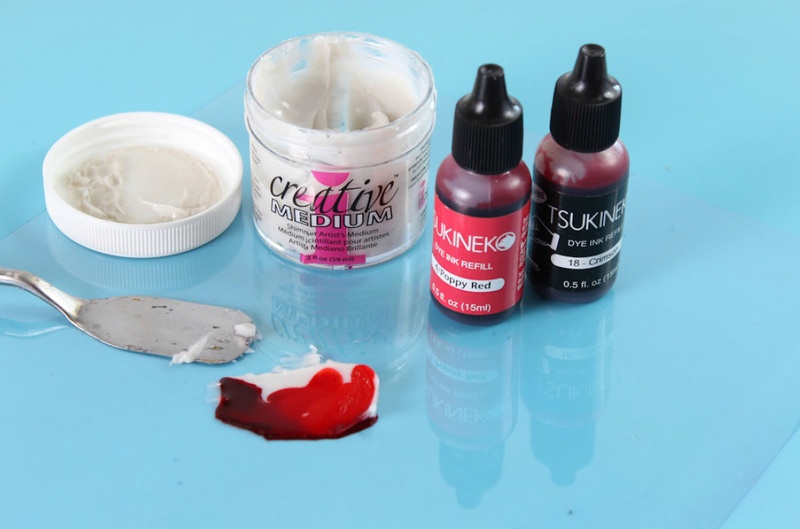 Mix the inker into the paste really well using your palette knife until the paste is fully colored. 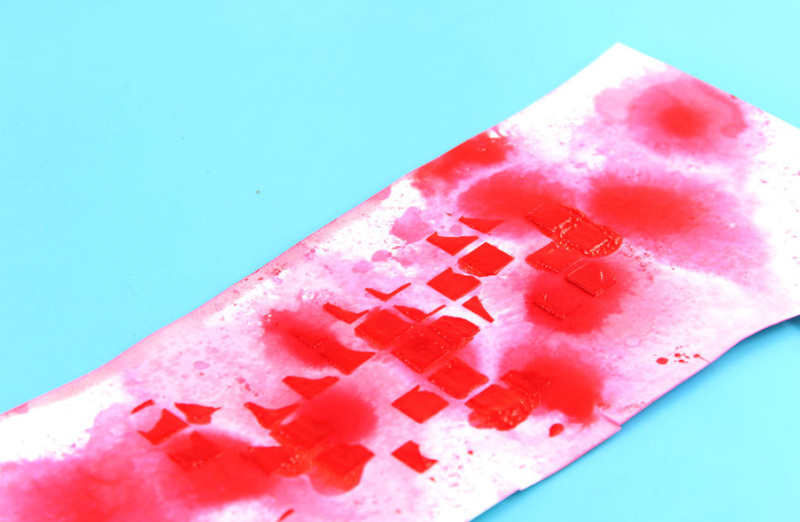 Apply the colored paste through a stencil onto craft paper and leave to dry. 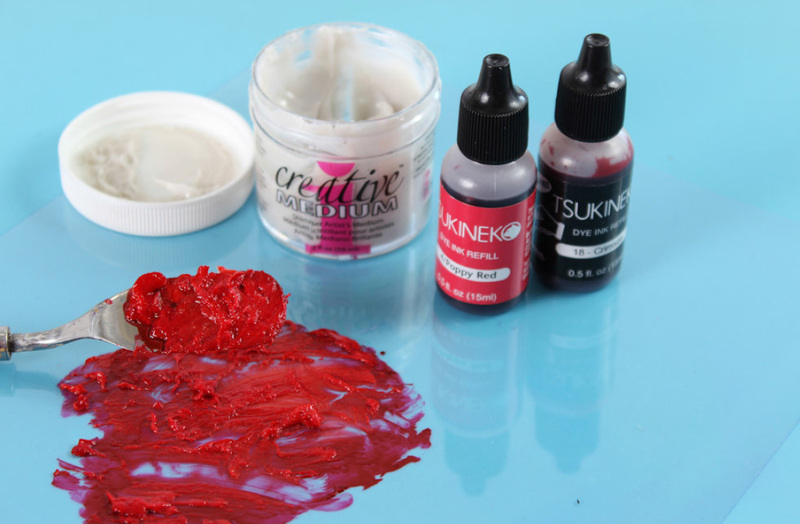 The creative medium dries really fast and has a stunning shimmer. Use the same inkers to color a piece of smooth white cardstock. Drop a few drops onto the cardstock and mist with water. 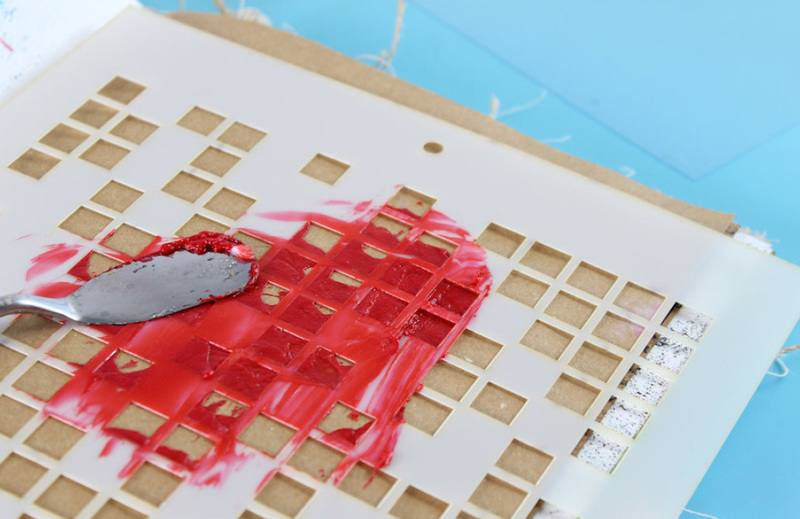 Apply some of the colored paste onto the colored cardstock using the same square stencil. Color a sheet of white cardstock with the same red inkers. 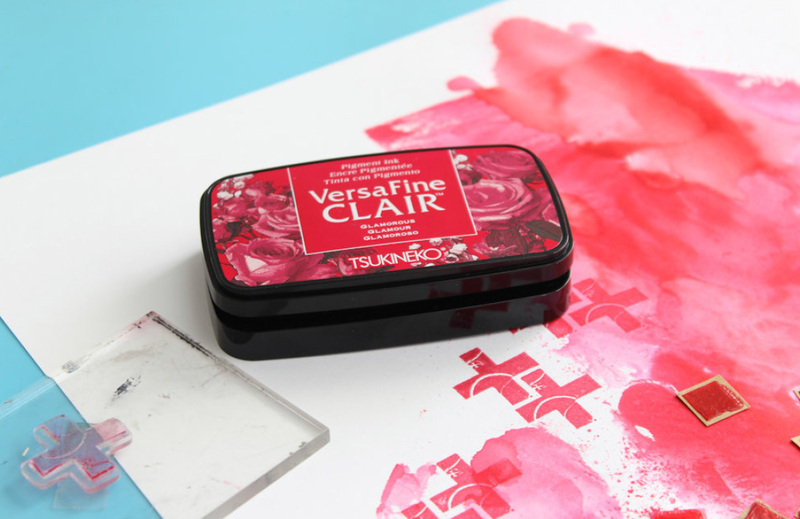 Once dry stamp some images onto the background using VersaFine Clair Glamorous. Add random color splats using Fireworks sprays to add color to the background. Cut out flowers from patterned papers and adhere them. Then stamp some random text in the background using VersaFine Clair. Use VersaFine Clair Pinecone and stencil some dots onto the background. Then adhere your photo. 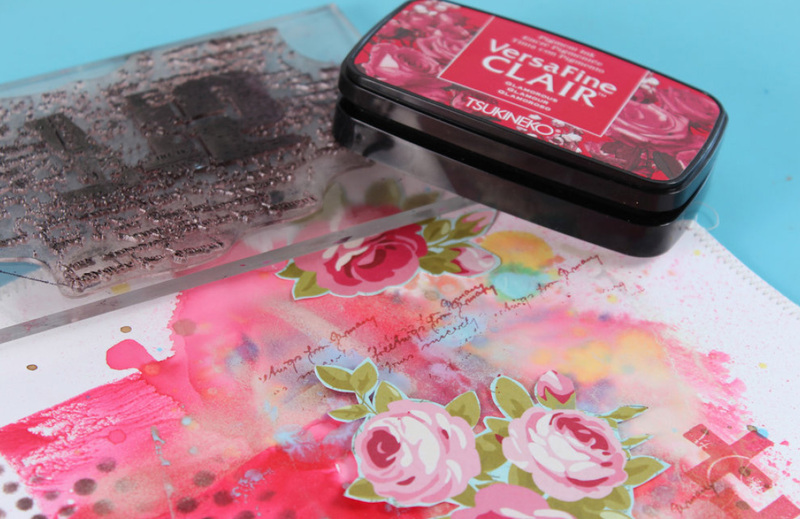 Cut stenciled squares with a beautiful shimmer from the papers and adhere to the layout. Add diamanté to finish off. There is always someone to rely on who is like an anchor in the sea! For today’s crafting reflection, I choose to make a handmade card with an ocean theme. Lately, I have been obsessed with Vertigo plastic surfaces and have made bookmarks with an ocean theme. Again, Vertigo sheets work so nice to give the impression of water and I used them for the background of this card. I lightly colored a Vertigo Taffeta sheet using just two StazOn colors that blend to give a beautiful turquoise effect of the sea. Then I decorated with the wooden fish shapes with Iridescent Creative medium to resemble the fish scales. The irRESISTible Pico Clear was used to give volume both on the anchor and the clear bubbles on the card. Although this card uses a variety of products, the design is still clean and simple and creates a lovely theme for you to share with that special someone in your life. The color blue and ocean themes makes me happy! Throw in this amazing little stamp set from Waffle Flower and my heart skipped a beat. I used some out-of-the-box techniques for this card, so let me share with you some of the details. On a sheet of Vertigo apply a thin layer of Creative Medium using a palette knife. Leave the medium to dry thoroughly. 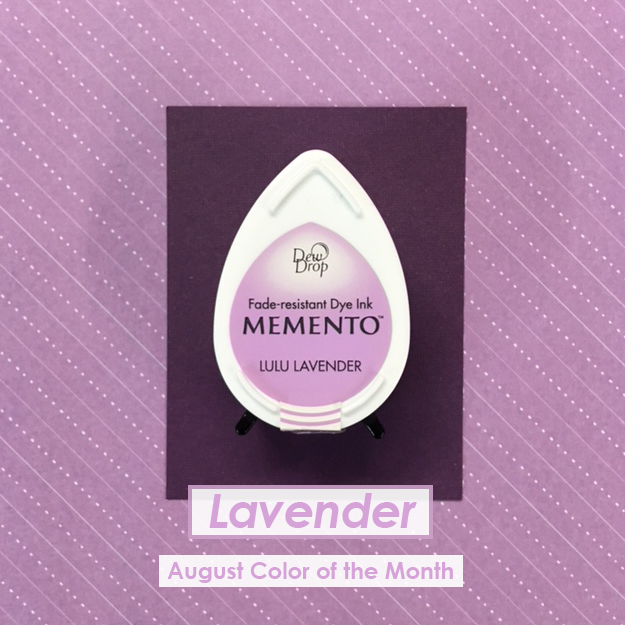 Once the creative medium is dry, color the Vertigo covered sheet using Memento Luxe ink. Lightly sweep the ink pad across the Vertigo and leave to dry. Out of blue cardstock die-cut with the Waffle Flower Life Anchor. Cover the die-cut anchor with a layer of GlazOn. While the GlazOn is still wet, lightly sprinkle with a layer of glitter and leave to dry. While you are letting the anchor dry, use a circle stencil to add color to your card background. Apply different inks to the stencil, mist with water and stamp with the stencil onto the cardstock. Leave to dry. Mix a small amount of texture paste and color it using blue acrylic paint and a small amount of Memento Luxe inker. Use your palette knife to mix the color into the paste really well. Apply the colored paste through a stencil using smooth strokes in one direction. Leave the paste to dry. Use your matching Waffle Flower Life Anchor stamp set and stamp words and waves onto the card in between the stenciling. Cut the strips of Vertigo into smaller strips and use GlazOn to adhere the strips to your card front. Use your sewing machine to sew around the edges and finish off your card with the anchor attached with a brad and some blue ink splats. We are back again for round 2 of CSI Case Files! What is a Case File you might ask? It is a super fun way for scrapbookers to explore their color choices and layout themes for scrapbooks. Today is the second part of the bi-monthly art challenge and we are happy to have our designers participating! Find out what Imagine’s Team discovered! If you missed the Case File No 231 then check it out here. What is a Case File you might ask? It is a super fun way for scrapbookers to explore their color choices and layout themes for scrapbooks. CSI does a bi-monthly art challenge and invites artists from around the world to participate. We are happy to announce that Imagine’s design team will be participating in today’s case file No. 231 and No. 232 (June 15th). Find out what Imagine’s Team discovered! Stay tuned for the next CSI!